McMaster University's Health Science Department holds a cadaver lab to facilitate education in anatomy. We have an unique opportunity to tour the lab to learn about human anatomy and physiology. Are you interested in applying for research practicums (PNB QQ3s & Q03s), research scholarships (NSERC), thesis, and other research opportunities? If so, be sure to check out our information session filled with details of application and tips! Senior students who are completing their thesis/research projects will be present to answer all your questions. 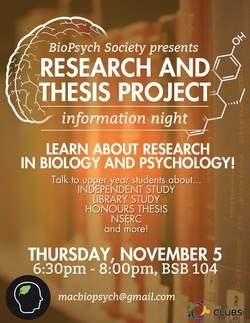 Come to find out what research projects students in BioPsych are a part of! Planning to apply to medical school, graduate studies or clinical psychology? 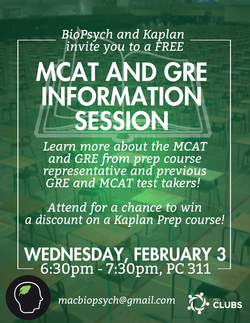 Be sure to attend our MCAT & GRE information sessions. We will update you on the new MCAT 2015 curriculum, and give you some pointers. In collaboration with the McMaster Biology Society, you will have the opportunity to meet the professors from the Biology Department! Conversations may range from their fascinating research, the classes that they teach, and potentially even their hobbies. 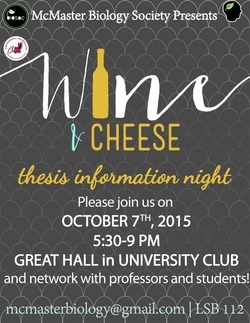 Don't miss out on this unique networking opportunity over a glass of wine* and a plate of cheese! 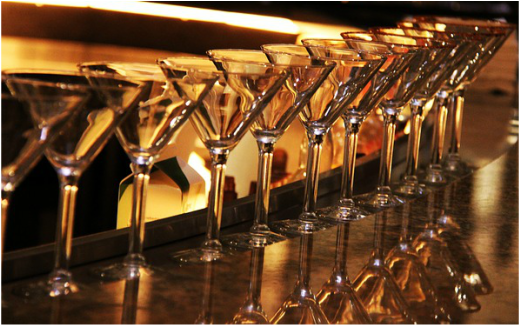 *Note: Students must be 19 years of age, or older, and bring valid ID to receive a drink ticket. The dress code is business casual. Collaborating with the McMaster Psychology, Neuroscience and Behaviour (PNB) Society, you will get a chance to meet the professors from the Psychology, Neuroscience and Behaviour department over some good food and wine*! If you are craving to learn about your professors research, and maybe even ask about potential QQ3/Q03/Thesis opportunities, this is a night that you do not want to miss. The first social event of the year lets first year BioPsych students and upper years mingle, and meet the executive team! There will be food and drinks and great company! Rep BioPsych in the most popular fashion trend among students! Come out to the Psych Lobby for some delicious holiday treats- what a sweet way to start the holiday season! A night of board games and video games where Biopsych and PNB students will have a chance to have fun, relax and engage in some friendly competition. There will be snacks, games, and most importantly, great people! Come out to the Psych Lobby and pick up some baked goods with a spooky twist! New Years Resolutions: Eat more brain food. What better way to feed your brain than glucose in its (almost) purest form! In collaboration with PNB Society and Social Sciences Society, we will be holding our annual Freudian Formal for all students in Psychology. There will be music, dance, delicious food, and activities to fill the night. Missed the opportunity to order BioPsych clothing? Come out to the Psych Lobby this week for a second chance to order some swag! Don't miss out! Brrr, it's getting cold! Warm up with some home-made goodies that are sure to sweeten even the most bitter days! We're not just book smart you know! Come out to the PNB Coffee House and listen to some great live music brought to you by your amazing PNBuddies! Come out and enjoy some great games, snacks and company at the Board Game Social hosted by the BioPsych, PNB and Board Game Societies! It'll be a night you will never get "board" of! See you there! Come out to PC Lobby and grab some magically delicious treats! Everyone will be after these lucky charms! If you think you can’t use the science you learn in the classroom, think again…The Department of Psychology, Neuroscience & Behaviour and the McMaster Alumni Association invite you to Discover Psychology: Science You Can Use. Unlike traditional colloquium, this special public lecture series is aimed towards students, staff, faculty, alumni, and all members of the public. The lectures feature dynamic McMaster professors discussing fascinating and practical topics related to the field of Psychology.